With a 1080p Full HD Front and Rear camera, the F750 is able to record pristine quality video that captures the crucial details of any incidents you may encounter while driving. Recording at 30 frames per second without dropping a single frame, you can rely on the F750 to capture every moment of your commute in high definition – be it an accident or an unexpected hit-and-run. 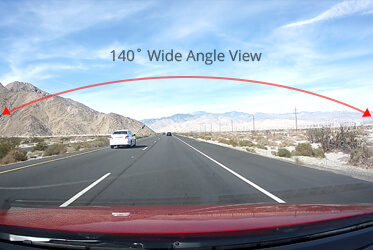 The THINKWARE Dash Cam F750 has a 140˚ wide viewing angle for maximum visibility, capturing a wider view of the roads. Tested and proven in various high quality action cameras, the processor ensures a stable and uninterrupted performance while the F750 performs various tasks. With a built-in GPS antenna, the F750 embeds speed, time and location data to the recorded videos to give you all the crucial information you need after an incident. This technology is specially designed to save recorded footage in both Micro SD and NAND Flash Memory when a certain level of impact is detected. This is particularly useful if the Micro SD card is removed or damaged due to the impact of a collision. With the Dual Save Technology that also saves footage in the NAND Flash Memory, you do not have to worry about it getting lost or damaged.